In early October, LNG Canada – a massive fracked gas facility for northern BC – was given the green light to proceed with construction. Just a few days later, the IPCC, the UN body for assessing the science related to climate change, released a special report with some drastic conclusions and a stark choice for our climate future. The scientists conclude we must limit global warming to 1.5oC to avoid catastrophic and runaway climate impacts to all global systems – natural, built, and social. It acknowledges the actions required to make this happen mean rapid, far-reaching and unprecedented changes in all aspects of society. The scientists tell us what needs to be done, and that it is possible. All that’s missing is political will. The report found significantly more severe climate impacts on health, sea level, droughts, floods and food production at 2°C compared to 1.5°C. Limiting warming to 1.5°C is critical. We are looking at a collapse of the global economic system and of human civilization as a whole if warming pushes past 1.5 to 2°C. Recent wildfires, hurricanes, flooding and heatwaves will be seen as the good old days in comparison. Today, we are at 1°C of warming and we are already witnessing unprecedented climate impacts. Climate scientists estimate that current emission reduction pledges under the 2015 Paris commitments— if met—will still result in a devastating 3°C of warming by 2100. BC’s current, newly legislated, targets are too weak for us to meet the Paris goal of limiting global warming to between 1.5 and 2°C. The IPCC report shows that on the current trajectory, the planet will warm by 1.5°C around 2040. It argues that halting the warming trend will require meeting net zero emissions. 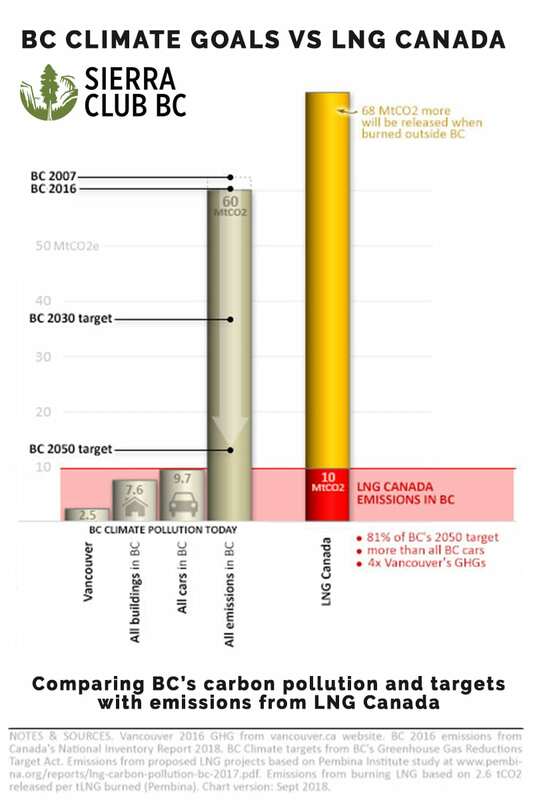 BC’s target is a reduction of 80% by 2050, compared to 2007 levels. We need zero emissions by 2050. Many other countries have reduced their emissions or committed to net zero emissions targets by 2040 or 2050 (e.g. France, Iceland, New Zealand, Costa Rica and Bhutan). But BC’s emissions have been increasing in four of the last five years and the province remains close to where it started ten years ago. Provincial estimates for LNG Canada wildly underestimate the amount of emissions this project would produce. While the BC government claims 3.45 million tonnes of emissions (for only half the project, and only part of the upstream emissions), credible estimates by the Pembina Institute and the Canadian Centre for Policy Alternatives range from 8.6 to 12 million tonnes for the full project. The project would consume the vast majority of B.C.’s 2050 emissions target (13 million tonnes), even under the current weak reduction targets. And LNG Canada’s emissions would take up the majority of BC’s climate budget, forcing the rest of the province to undergo drastic sacrifices to cut their emissions. Fracked gas is not part of the clean energy transition. It is as bad as coal. Recent research suggests that methane emissions from fracking are at least 2.5 times higher than what the province estimates and that almost half of BC’s active wells are emitting methane-rich plumes. NASA recently attributed the global increase of the powerful greenhouse gas methane to the oil and gas industry. Methane is 84 times more powerful than carbon dioxide as a greenhouse gas. Methane leakage from fracking wells makes the use of gas as bad as coal for the climate. Fracked LNG exports could also displace renewables in China and would be guaranteed to displace cleaner energy sources if exported to Japan and Korean, thereby increasing global emissions, according to the CCPA. It is dangerous to think that expanding this fossil fuel will somehow reduce global emissions. The BC government is going to announce its climate plan, any day now. Premier Horgan speaks of climate leadership, yet he is championing the LNG Canada project and offering $6 billion in subsidies to help it be built. For a meaningful climate plan, we need stronger climate targets to stay below 1.5 degrees. And it’s not enough to simply have targets, we need interim 5-year targets for all sectors of the economy, with accountability so there is an incentive to meet the targets. And as yet another massive LNG project is proposed, the Kwispaa project on Vancouver Island, it’s more clear than ever that we need a climate test for all major energy projects, a test that stops projects whose carbon footprint makes meeting targets impossible. To willfully ignore the science and promote fossil fuel expansion is a new form of climate denial. Climate leaders do not approve massive energy projects that increase global emissions far past the targets necessary to avoid catastrophic global consequences. LNG Canada is not compatible with the future we desperately need to start planning for. The carbon footprint of LNG Canada’s Kitimat project cannot fit in any credible climate action plan. 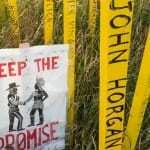 LNG Canada and other LNG facilities should not be allowed to proceed. Please call on the BC government to stop promoting fossil fuel expansion and start taking the strong, decisive climate action we need today.